U.S. 54 (Patriot Freeway) and Spur 601 (Liberty Expressway) come together at a semi directional T interchange. Photo taken 04/25/17. Spur 601 (Liberty Expressway) heads west from the DDI with Loop 375 with three lanes to Exit 26 with Constitution Avenue. Photo taken 04/25/17. The first confirming marker for Spur 601. Speed limits are posted at 60 miles per hour throughout the Liberty Expressway. Photo taken 04/25/17. Entering the diamond interchange (Exit 26) with Constitution Avenue on SS 601 west in Fort Bliss. Photo taken 04/25/17. Spur 601 (Liberty Expressway) curves southwest ahead of the succeeding exit for Old Ironsides Drive north and Global Reach Drive south. Photo taken 04/25/17. There is no direct access from Spur 601 westbound to Airport Road. Instead motorists must navigate west along parallel Walter Jones Boulevard to link with Airport Road south. Photo taken 04/25/17. Biggs Army Airfield lies just northwest of Spur 601 via Old Ironsides Avenue. El Paso International Airport (ELP) spreads to the south. Photo taken 04/25/17. Westbound at the diamond interchange (Exit 25) with Global Reach and Old Ironsides Drives. Photo taken 04/25/17. Wide chevrons and bridges along Spur 601 can accommodate future expansion of the Liberty Expressway to six overall lanes. The eastern 28,000 feet of Spur 601 was designed as a four-lane highway with 4 foot inside and 8 foot outside shoulders. West of Airport Road, the remaining 9,400 feet of freeway expands to include six, 12-foot wide travel lanes with 10-foot shoulders.3 Photo taken 04/25/17. Sergeant Major Boulevard converges with Spur 601 west at Airport Road in 0.75 miles. Photo taken 04/25/17. Commercial vehicles headed to Fort Bliss are directed further west to Exit 20B and Fred Wilson Boulevard. Photo taken 04/25/17. The main gate for Biggs AAF lies just east of Exit 22 along Sgt. Major Boulevard. Photo taken 04/25/17. Exit 22 departs Spur 601 west independent of the adjacent three-wye interchange with the north end of Airport Road and west end of Sgt. Major Boulevard. Photo taken 04/25/17. Sgt. Major Boulevard transitions into a north side frontage road for Spur 601. Fort Bliss National Cemetery lies just south of the freeway beyond forthcoming Exit 20B. Photo taken 04/25/17. Marshall Road stems north from a half diamond interchange (Exit 20B) with Fred Wilson Avenue to Railroad Drive. Marshall Road formerly connected with the Fort Bliss military housing area to the south. Photo taken 04/25/17. Spur 601 rises onto a viaduct above Chaffee Road. The elevated roadway continues west to the semi directional T interchange (Exit 20A) with U.S. 54 (Patriot Freeway). Photo taken 04/25/17. The on-ramp from Chaffee Road forms an auxiliary lane to Exit 20B. Railroad Drive parallels both the western boundary of Fort Bliss and a Union Pacific Railroad. Photo taken 04/25/17. Exit 20B lowers from the Liberty Expressway west as three lanes advance west to the flyovers for U.S. 54 and the freeway end at Fred Wilson Avenue. Photo taken 04/25/17. U.S. 54 follows the Patriot Freeway south to IH 10 and SL 375 east of Downtown El Paso. Northward, the freeway extends another 7.5 miles north to Sean Haggerty Drive at Northeast El Paso. Photo taken 04/25/17. Single lane flyovers separate for U.S. 54. U.S. 54 travels 20 miles through El Paso County, linking West Texas with Alamogordo, New Mexico and U.S. 70. Photos taken 04/25/17. "More Exits Will Open Soon on Fort Bliss-East Side Highway." El Paso Times (TX), March 17, 2010. 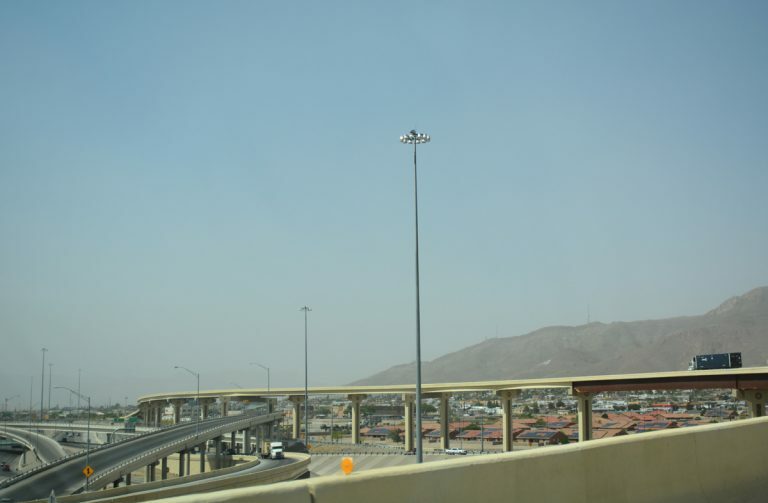 "Part of Inner Loop opens: Spur will connect East Side El Paso to Fort Bliss." El Paso Times (TX), May 30, 2009. "Diana Washington Valdez: Spur 601 completion celebration Wednesday." El Paso Times (TX), April 24, 2011.